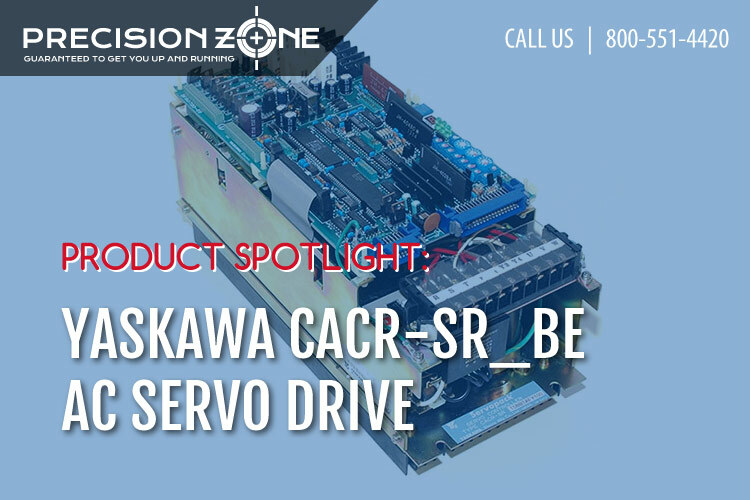 We will be highlighting CACR-SR_BE drives this month. The CACR-SR_BE is a AC servo pack capable of ranges anywhere from .2 KW all the way up to 6 KW. It takes a 200V input. This drive features a compact design with easy to understand wiring and a all digital operator to adjust you parameters accordingly. Also, it has versatile functions such as torque control, soft start, etc. All of these features come with high reliability. The servo pack comes equipped with a overload protection circuit which prevents it and the motor from overloading. The overload detection level is set by a temperature of 55 degrees Celsius and cannot be changed with any parameters. The protection circuit ensures major damage does not occur to the drive or motor where it is beyond repair. Hurco machines with this drive need to be balanced properly in order to work at its peak performance. Otherwise, the functionality of Hurco machine will be compromised which means the speed the drive outputs and actual speed of the motor will be incorrect. This will cause problems in low error tolerance projects. Any qualified technician would be able to properly balance your drive. There are three common alarms on this drive series. One of the most common alarms with these drives are A.10 and A.71 alarm. A.10 is an indication of either overheat or over-current, while A.71 is an instantaneous overload condition. A couple things could cause these issues. First and foremost, you will want to meg your motor. Megging the motor ensures you motor insulation is in good condition. If the meggar determines it is not in good condition, then over time the drive will be come up with a over-current alarm or overload alarm. This is due to the fact one of the phases of the drive is getting shorted to ground from the motor. This principle is can be applied for the majority of drives. It is advised to meg the motor around a 1000V if possible to ensure the insulation for the motor is working well. The next common issue which causes A.10 is a defective power transistor module. This is most likely the case if A.10 is displayed only when power is supplied to the main circuit. In this case, it is recommended , you have a tech come service the drive or you send the drive in for repair. It is advised that no one without any professional background troubleshoots the drive. Someone who is inexperienced could easily cause more damage to the drive which could be irreversible. The last common alarm we will discuss is the A.20. A.20 is alerts the user the main circuit breaker of the drive has been tripped for some reason. If this alarm comes up right after someone serviced or repaired the drive, the likely cause is the main circuit breaker was likely turned to the OFF position and just needs to be adjusted to the ON position. It is a small thing to check when first installing a newly repaired drive which many people forget to check. If you continuously need to reset the breaker from the OFF position to the ON position during operation, the drive should be sent in for an evaluation since something is likely wrong with one of the components.